Better Than The Sum Of Its Parts? Have you ever wondered what the effect of something as simple as parts quality has on the sound of a component? Well, for $149 The Parts Connection (TPC) offers an upgrade kit for the Assemblage DAC-2 that shows you exactly that. Yes, I know, IF you are an experienced DIY'er, you can mod any piece of equipment. But since most of us are not experienced with a soldering iron, nor very comfortable modding our own gear, the advantages of the DAC-2 upgrade are several. 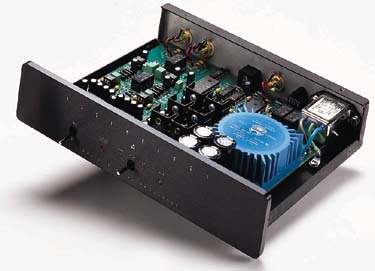 First, you start from an excellent base (please see the full review of the DAC-2 in our archives). Second, TPC supplies you with all the parts you need, carefully selected to work together to extract the most from the DAC-2 design. Third, TPC gives you a well written, 14 page manual as a guide, with pictures for the neophyte and schematics for the expert. Fourth, just as with the DAC-2 kit, TPC guarantees that if you can't get the DAC-2 to work, they will. And finally, unlike modifying almost any other component, this upgrade does not void your warranty. But, as always, the real value comes in the sound quality. So, exactly how does parts quality affect sound quality? If you remember our first encounter with the DAC-2, in its stock form it offers superb detail retrieval, excellent staging, rock-steady time keeping and a lively, up front presentation. On the debit side of the ledger, it is a little harmonically thin and does not reach as low in the bass as other sub 1k DACs can. Also, in spite of its lively presentation, dynamic swings are slightly soft. Still, for $499, it offers far more than a glimpse of Shangri-La. I very much enjoyed having the DAC-2 around, and found it to be a better overall processor than the $799 Audio Alchemy DDE 3.0 when the DDE was using its stock power supply. It was only when the 3.0 was powered by the $259, add-on PS3 (raising the total cost to more than twice that of the DAC-2) that the Audio Alchemy shook free of the Assemblage. After reading our review, TPC offered to send us the DAC-2 upgrade kit and then challenged us to put the modded DAC-2 up against the DDE 3.0 with the PS-3. Since I attributed the superiority of the DDE over the DAC-2 to the beefy PS-3, I was very interested to see if an increase in parts quality alone would raise the performance of the DAC-2 to a point where it would match or even exceed capability of the Audio Alchemy unit. Wonder no more, because boldly stated -- it did! Carrying out the DAC-2 upgrade is actually an easy process, at least it is if you have several uninterrupted hours, a well-lit workspace, a good soldering iron and patience. When I spoke with John Stewart at TPC he said that if the original DAC-2 kit was a 1 on a 1 to 5 scale of difficulty, then the upgrade is a 3 to 3.5. My experience with the upgrade is that this a kit a beginner can do, as long as you take your time. The mod involves removing a bridge rectifier and replacing it with 4 smaller, soft recovery Telefunken diodes, removing 12 Holco resistors and replacing them with Caddocks, removing 6 Wima capacitors and replacing them with MIT Multicaps, removing and replacing 4 regulators (the toughest part), bypassing the power supply caps, replacing 2 RCA jacks, replacing the Kimber copper hook-up wire with Kimber silver, replacing the digital coax input wire with Chris Sommovigo's (of Illuminati) 75 ohm wire, as well as several other odds and ends. The manual walks you through the process in an orderly, confident manner, and with a nice touch of humor. Perhaps most importantly, the PCB was designed with the upgrade in mind. In almost every case, when you clip out an old piece, its replacement slides into adjoining, pre-cast holes. This step alone greatly reduces the skill needed to complete the kit. For the inexperienced this may not seem like much, but this eliminates the need to de-solder (except for the regulators). Besides making things easier, not having to de-solder also eliminates the easiest way to damage the PCB itself. Stop playing Hitchcock and give us the details! Okay, so after you are done what do you get? First, the harmonic thinness I noted in the first review was gone. Really. In fact, my first impression was of almost too much richness. However, with break-in the DAC-2 reached a remarkable balance of detail and richness. For example, I use the Cowboy Junkies Lay It Down album as a test for both detail retrieval and harmonic expression. The very atmospheric production can cause an inferior component to reproduce sonic soup while an overly dry component will render an emotionless picture. To find the correct balance is an achievement well worth talking about, and one that the DAC-2 had me talking about. Margo Timmons' voice put actual shivers down my spine. I know it sounds like hyperbole, but I have yet to hear as much natural detail in her voice as I do while using the DAC-2. Some of that must be chalked up to the outstanding Dunlavy SC-III speakers as well as the rest of the system, but the DAC-2 was doing its part well. As for the rest of the musicians, the mix on the album was easily decipherable, but at the same time drawn from a rich harmonic palette. Very natural. And yes, the DAC-2 finds a better, more natural balance here than the Audio Alchemy DDE 3.0 does, even with the PS3. As for the bass, the parts upgrade had only a slight affect on bass extension, although it did add a touch of (natural) richness to the mid-bass, increasing bass quality. Dynamics improved slightly as well, but not quite to the level of the DDE 3.0 with the PS3. Still, after careful side by side listening these are the only areas where the Audio Alchemy unit bettered the Assemblage. And even in these areas the gap between the units had narrowed appreciably. So much so that I found I spent most of my time listening to the DAC-2. Not bad for a unit costing $648 versus one coming in for $410 more! I really have to say that the DAC-2 with the parts upgrade is a superior unit to the Audio Alchemy DDE 3.0, even though that means that the re-sale value of my DDE will probably go down (nothing like the truth hitting you in the pocketbook). If asked to sum up the changes caused by the parts upgrade in one phrase it would be more analog-like. And if asked to describe the way the DAC-2 betters the DDE 3.0, in a phrase it would be more natural. This is a best buy DAC that gets both my utmost respect and highest recommendation. By that I do not mean to say it is the ultimate DAC on the market, but rather, that I am sincerely surprised and pleased by the sonic and musical quality of the DAC-2. You need to spend at least 2 to 3 times as much to better its combination of strengths and pleasures. So, do I think parts quality is important? You bet your sweet bippy I do! If you have a DAC-2, you need this upgrade. P.S. - As a final step, after I finished this review I went back and defeated the HDCD analog attenuation. Although technically the only effect of this should be to raise the output by 6dB, I found a very slight increase in bass extension and an equal increase in dynamics. While slight in absolute terms, the increase was enough for me to recommend that as long as you are in there upgrading, you ought to take this step as well. Good Luck! Thank you for taking the time to install and review the Parts Upgrade Kit for the Assemblage DAC-2. When we originally conceived of the DAC-2, we thought it would be an interesting idea if we incorporated into the unit (especially with the PCB board lay-out), the ability to incorporate future upgrades. This was due in part to the many requests we had from customers who had bought our first generation D/A convertor, the DAC-1, and wanted to extract even more performance from this little upstart. Little did we expect that there were (are) so many enthusiasts, willing to try their hands at some hard-core audiophile upgrading. We decided that the upgrade kit must not only be fun to do, but that it must also offer a sonic improvement, at least commensurate with the additional expenditure required in terms of time and money. Thank you for helping to confirm our suspicions ! Again, thank you for taking the time to not only review the DAC-2, but also for taking the time to install the Parts Upgrade Kit and re-review the unit again.